Well, things got a little off kilter last week and I didn’t get a photoessay posted on Friday. This has just been a crazy spring! Unfortunately, it looks like that “crazy” is going to take a turn in the weather today too. It looks like we only have one tomato casualty from planting last week, and I’m hoping that whatever storms we get today don’t flatten all the rest. I’ve already brought our extra plants (mostly) inside, so we have some replacements in reasonably good condition for replanting tomorrow if needed. This is why I am in the habit of planting 3 tomatoes when I only need one for the garden – I have some leeway if one doesn’t germinate and if one dies after planting from disease or disaster. It’ll be nice if we don’t have to do a lot of replanting tomorrow! Anyway, let’s look at some pictures from last Friday when it was sunny and not misty with a chance of nasty. 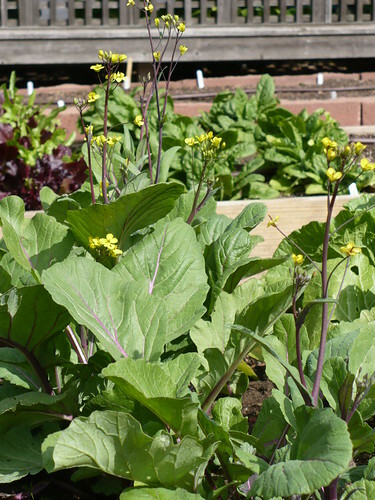 This is the Hon Tsai Tai, broccoli raab. It is putting on flower stalks. The flower stalks are supposed to be the edible part, although technically I believe you are supposed to harvest them before the bloom. Doesn’t affect their edibility, just the strength of flavor! The stems are rather smaller than I was expecting. 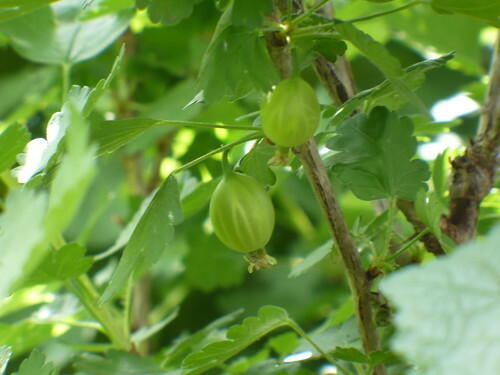 I wove my way back into the jungle of fruit plants to check on the fruit set for the gooseberry plant. Yes, there are more than 2 fruit on it, but these were the most readily accessible for picture-taking. Actually, I’m pretty pleased with the potential yield. The red currants are beginning to show a hint of color. If I remember correctly, this is pretty early! I’m beginning to regret throwing out the bird netting. I’m afraid that if I want any currants, I’m going to have to keep the birds off. Robins are so destructive in fruit gardens! 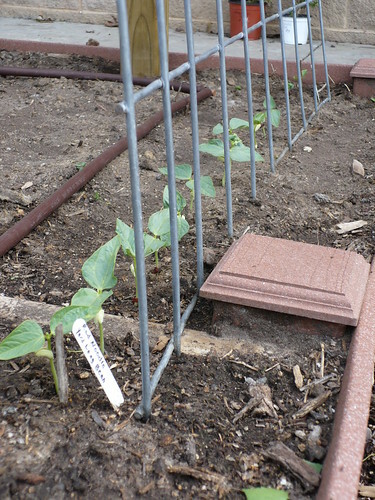 Posted on May 10, 2010, in PhotoEssays and tagged berries, flowers, fruit, vegetable gardening. Bookmark the permalink. 2 Comments. 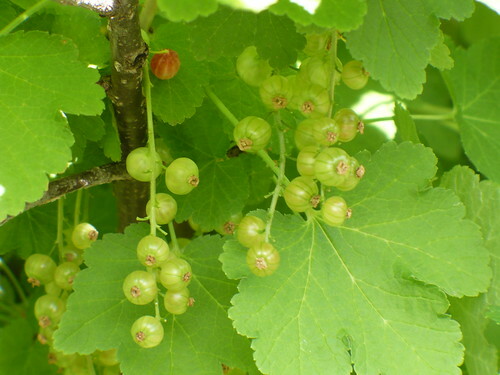 Mmmm, gooseberries. What variety do you have? I’m pretty sure our gooseberry plant is Captivator. It’s been moved around and the plants are so thick that I’m not sure where the label is at the moment. But I know it’s supposed to be red!